GMO Sweet Corn Varieties and Genetic-Contamination – Just Label It! In Turn Here Sweet Corn: Organic Farming Works, I wrote about cross-pollination and the threat of genetically modified organisms. If our sweet corn is cross-pollinated by neighboring field corn, it is not sweet nor is it marketable. Martin manages this threat by recording the dates of all the developmental stages for our crop, as well as the neighbors’ planting and pollen dates. He then adjusts his varieties and planting sequence by what the neighbors plant and when. But genetic contamination is impossible to avoid completely. When there are field corn–pollinated kernels in our sweet corn, they are visible; dark yellow kernels mixed in like polka dots among the small, tender sweet corn kernels. But now there is an even larger challenge and looming threat. [Read more…] about GMO Sweet Corn Varieties and Genetic-Contamination – Just Label It! I wrote in a post on Monday . . .
1. Chemical Trespass: Minnesota organic farmers Oluf and Debra Johnson had success in 2011 when the Minnesota Court of Appeals ruled that an organic farm surrounded by chemical-laden conventional farms can seek damages for lost crops, as well as lost profits, caused by the illegal trespassing of pesticides and herbicides on its property. We should have a right to a pesticide free environment, but we don’t. Not yet anyway. Vande Vegte, the Johnsons’ attorney, said he plans to take the case forward. I expect there will be more of these cases in the years ahead. Turn Here Sweet Corn . . . the CORN DANCE! 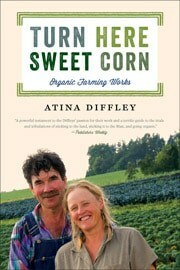 Read Atina Diffley's Blog: What Is A Farm? Workshops and Coaching/Consulting with Atina and Martin Diffley.